Last Thursday, scholarship recipients, families, and supporters gathered at the Falls Event Center in Manchester to celebrate the success of Children’s Scholarship Fund (CSF) and the difference scholarships are making in the lives of CSF Scholars and their families in New Hampshire. Several CSF parents and students were on hand to share their experiences using scholarships. Shalimar Encarnacion, mother of CSF Alumnus Angel, told the group how Angel blossomed as a CSF Scholar, going from frequent suspensions and an IEP to doing well academically and enjoying school. Today, Angel attends a STEM charter high school and his future ambitions include attending Harvard Law School! He no longer has an IEP and holds a B+ GPA. Another CSF parent, Abi Cyr, spoke about how she and her husband have been able to choose the schools that best meet their children’s needs thanks to CSF scholarships. In particular, Ms. Cyr noted that her adopted son, Thadd, has benefited greatly from the extra attention and care he has received at his private school as a CSF Scholar. In fact, this year marks the first time in his short academic career that Thadd is attending the same school for two consecutive years. “Your gift was our miracle! I’m pleased to let you know that this year, Thadd is a thriving fifth grader. He has been stimulated scholastically, has developed self-confidence, and has built positive peer relationships,” Ms. Cyr shared. CSF President Darla Romfo announced a new challenge grant from the national CSF to the New Hampshire program, and Harold Turner, a generous supporter of CSF’s New Hampshire program, spoke about his motivation to fund scholarships, and challenged the group with a surprise extra $5,000 matching grant for donations raised after the CSF match is fulfilled. Very special thanks go to the evening’s sponsors, The Roedel Companies/Falls Event Center and Maverick Integration/Maverick Technical Institute. 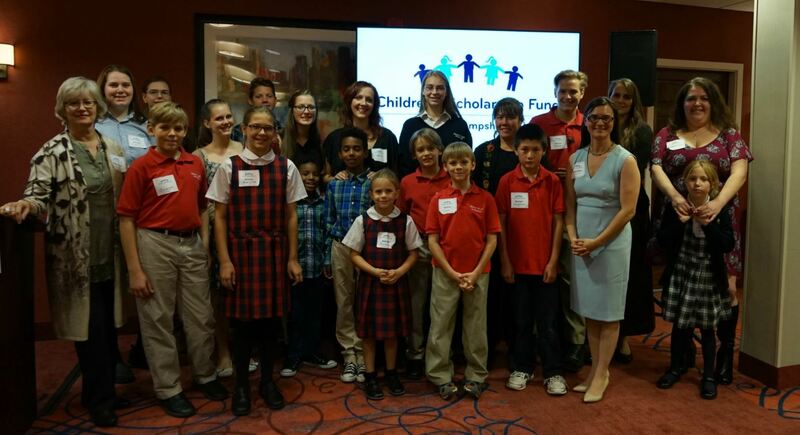 For the 2016-17 school year, CSF is providing scholarships for 122 New Hampshire children at private schools, out-of-district public schools, and homeschools. Donations to CSF for scholarships are eligible for a New Hampshire Education Tax Credit. Please see www.csfnewhampshire.org for more information.